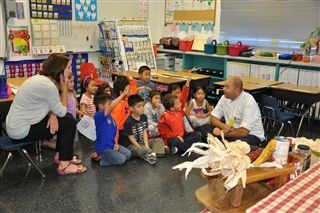 Chef Amanda and Chef George, of the Four Seasons Restaurant, had a room full of enthusiastic 1st graders to entertain and educate, and they rose to the task admirably. The pair made an interesting and engaging presentation about corn as if they teach easily distracted young pupils for a living. 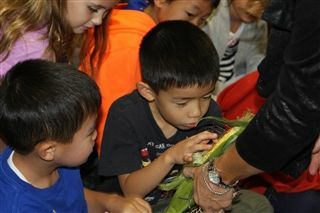 The students already knew that corn is a tasty vegetable that can be enjoyed on or off the cob, so the chefs didn’t dwell on that concept for long. 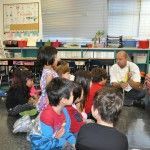 The children learned that corn is something that is present in many food items they wouldn’t expect- like sugary syrups, tortillas and marshmallows, to name a few. The real excitement, however, came with a demonstration of what popcorn looks like when it bursts. 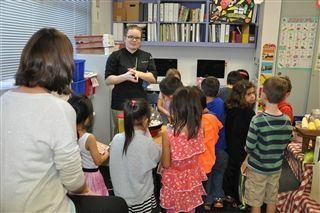 Equipped with a popper and raw kernels, Chef George and Chef Amanda treated the class to a show of bursting popcorn that you would normally miss out on if you were using a microwave. Another thing the children learned was how much creativity cooking allows and requires if one uses basic ingredients rather than packaged foods. Instead of having to choose from pre-prepared flavors, the kids saw that because the chefs could add what they chose to the popcorn, they ended up with a simple but delicious snack with quite a bit of variety. One batch was a pumpkin spice flavor, another had Parmesan, and the third was plain. As you can imagine, all three were thoroughly enjoyed by the entire class, with some children asking for thirds. At the end of the presentation, when the chefs started to pack up their ingredients – and creatively assembled set of props – they asked the class if anyone wanted to be a chef when they grew up. They were met with a cacophony of shouts as some kids yelled “yes!” and others “me! me!”, and all jumped up and down with enormous smiles on their faces.